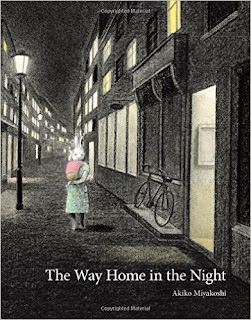 The beautifully illustrated children’s book The Way Home in the Night by Akiko Miyakoshi is a wonderful addition to your kid lit collection. The simple story tells the story of a young bunny’s walk home with her mother. The black and white illustrations work to highlight the different activities taking place in her neighbor’s windows. Who is cooking? Who is reading? Who is having a party? Who is sleeping? The neutral colors allow readers glimpses into various scenarios while imagining what takes place in homes other than their own every night. This is another hit for the award winning author and illustrator, Akiko Miyakoshi. If your little ones have curious minds, I recommend this book. The illustrations alone make it worthy of your attention.